The Juggling Homemaker: Make your own bean dip! Make your own bean dip! All ready to eat my chip with my homemade dip! One of the things I stopped buying when the economy tanked was bean dip. That probably sounds funny to some of you, but really it was too expensive and went too fast for me to justify it to myself. We could quickly go through a can of Fritos Bean Dip in one sitting, along with half a bag of Nacho Cheese Doritos. 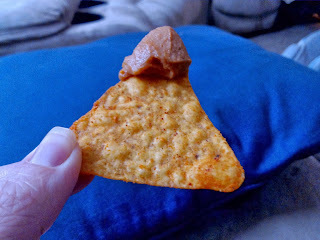 I have to say I missed that dip, and Doritos just weren't the same without it and I rarely ate them because of that. A few days ago it hit me: I make my own honey butter, garlic butter spread (to make garlic bread and grilled cheese sandwiches) and frosting--all things I once bought from the store without much thought. I figured out how to make those things because it was cheaper and often tastier to do them myself. So why couldn't I make my own bean dip? I did what I do best and scoured the internet for a recipe that would taste just like the Fritos one (because you could say I'm a bit picky). I found a recipe on a site called Eat Cake for Dinner that I decided to try. It calls for a 16 oz can of refried beans, sliced jalapenos, some of the brine, paprika, cayenne (red) pepper, onion powder, garlic powder, salt, and sugar. I keep most of these things as staples in my pantry, so I only had to go buy cayenne pepper and jalapenos from the store to give it a try. The main reason I didn't hesitate to try it was because it sounded so easy! I only had to put all the ingredients in the food processer. I put all of the ingredients in my little kitchenaide chopper on the puree setting and ran it until it was smooth. Then I scooped it all into a storage bowl. We did try it after only about 30 minutes in the fridge. I prefer it colder than that and liked it better after it'd been in the fridge overnight. Overall, I think it was a hit. Both my hubby and my oldest son couldn't stay out of it. It's cheap though, so for once it didn't panic me to see it disappearing so fast!